Shrewsbury Town's opening-day defeat by Millwall shows how quickly they need to adapt to life back in League One says Shrews defender Mat Sadler. Despite taking the lead against the Lions at the New Meadow on Saturday, Town lost 2-1 with Sadler fouling Steve Morison for the match-winning penalty. "It showed what we're going to need to be like to do well at the top end this season," Sadler, 30, said. "We need to be more wily - especially after going 1-0 up at home." Shrewsbury had the best home record in League Two last season, winning 17 games and losing only twice as they secured automatic promotion. Defeat by Millwall was their second in a row at New Meadow, though, after a 2-0 loss to Plymouth on the final day of last term. Sadler added to BBC Radio Shropshire: "Anyone who doubted that there was a step up into League One would've seen that that's the case, but we'll learn. "It was a penalty - I've clipped him - it was an instinctive thing but all you can do it learn from that and it was a mistake." 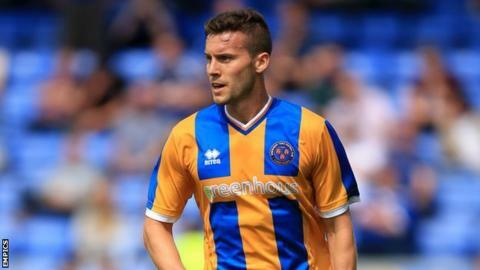 The former Birmingham City, Walsall and Crawley full-back was one of seven debutants for Shrewsbury against Millwall having re-joined in the summer after leaving Rotherham. "In three or four games' time we'll probably be a different animal," Sadler added. "We'll get fitter and stronger and we just need to take the positives from this week and learn our lessons, it's a long season and they'll be plenty of ups and downs."